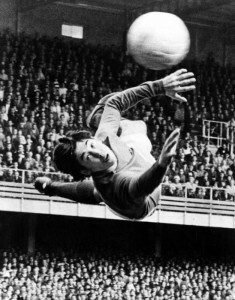 Gordon Banks’ sad death at the age of eighty one reminds us of just what a hero he was to so many English football fans. The only England goalkeeper to win the World Cup and forever remembered for ‘That Save’ in the 1970 World Cup against Pelé, Banks, along with the Soviet legend, Lev Yashin was the first true goalkeeping hero, particularly in England when so much focus was usually given to outfield players. The FIFA Goalkeeper of the Year six times, he was an astonishingly gifted goalkeeper, small for his position, he would influence many of the great goalkeepers who followed in his footsteps, he was named the second greatest goalkeeper of the 20th century after Lev Yashin and played a vital role in Stoke City’s immortal FA Cup final victory in 1972. Banks was of the generation before my football heroes, I grew up with his successors in the mid Seventies; Ray Clemence, Peter Shilton, Sepp Maier, Peter Bonetti and so on. Shilton and Clemence enjoyed a great rivalry for the England number one shirt but Banks was never challenged, he was that good. Tactically astute, his positional play was remarkable and of course he played with heavier boots, a heavier ball and on much poorer playing surfaces. So what of ‘that save’? Well, for the vast majority of fans it was the greatest save of all time against Pelé, arguably the greatest player of all time playing for the greatest national team of all time, Brazil. Quite how he not only managed to cover the ground to stop the shot but ensure it went out of play to avoid the rebound we can never know but he did. Pelé actually shouted “goal” after he headed it, so convinced he had scored. It became a truly iconic moment in world sport and cemented Banks’ name in history. Blinded in one eye by an injury from a car accident he played his final game for Stoke City against Liverpool where the Liverpool fans chanted to their goalkeeper, Ray Clemence “You’re not as good as Gordon!” and gave him a rapturous reception as he took his position in front of the Kop end. Banks was a real boyhood hero, I remember as a boy playing football and when anyone made a half decent save it would be acknowledged as a ‘Gordon Banks’ years after he retired. He, like the rest of the 1966 World Cup team were respectful, down to earth men who played for their country with absolute pride. That he was never knighted for his services to the game will forever perplex me and many, many others. Listen to David Coleman’s commentary, it encapsulates all that was so special about football in the 1970s and enjoy Banks v Pelé…..